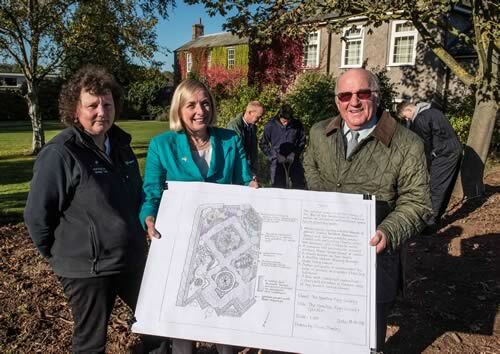 It's 12 months until Newton Rigg College celebrates its 120th anniversary next year, but work is already underway for a commemorative garden which will mark the important milestone. The garden lies at the heart of the campus and is being reconfigured by staff and students to reflect the landscape of the surrounding Cumbrian countryside. It will be known as the Newton Rigg Society Garden as the Society has played a significant role in the project. left to right: Shelagh Todd, senior horticulture lecturer at Newton Rigg College, Fiona Kidd and John Rigg, of the Newton Rigg Society with the design plans, and in the background, students Kyle Upecz and Nathan Caster hard at work with tutor Ian Hoffman in the refurbished garden at the College. The garden design is the work of former student Alison Stanley. Alison studied horticulture at the college and now runs her own business in Cockermouth. Led by senior lecturer Shelagh Todd, the practical work is being carried out by students across a number of departments including forestry, agriculture, countryside management as well as horticulture. Alison's design includes a circular sheep fold and seat made from Dacre limestone built by members of the Dry Stone Walling Association. There is also an orchard of local fruit trees including the “Keswick Codling” and Cumbrian Damson which is under-planted with a Cumbria-inspired wild flower meadow. One of the borders incorporates a golden fruited crab apple to represent the golden apples on the Newton Rigg shield. Elsewhere a stream will be included, a specimen Rowan tree, flowering heath plants, ornamental moor grasses and a Honister slate path edged with sandstone from Lazonby Quarry. The garden will be enclosed by a yew and privet hedge and a dry stone wall built by students is an important feature. Wrought iron gates will be specially constructed and mark the anniversary by saying “Newton Rigg Society Garden, 1896 – 2016”.